In all, I froze 21 meals. I was able to shop for ingredients, prepare the food, and freeze it in portions that worked for my family, all in one day. Throughout the week, I was able to pull things out of the freezer for dinners. It was so comforting to be leaving work each afternoon, knowing that dinner was already prepared. On the far left, we have 3 meatloaves. The top, left basket has been taken over by tons of chicken noodle soup. The bottom, left basket has hamburger casserole, cooked, cubed chicken, and also cooked chicken fajita meat. 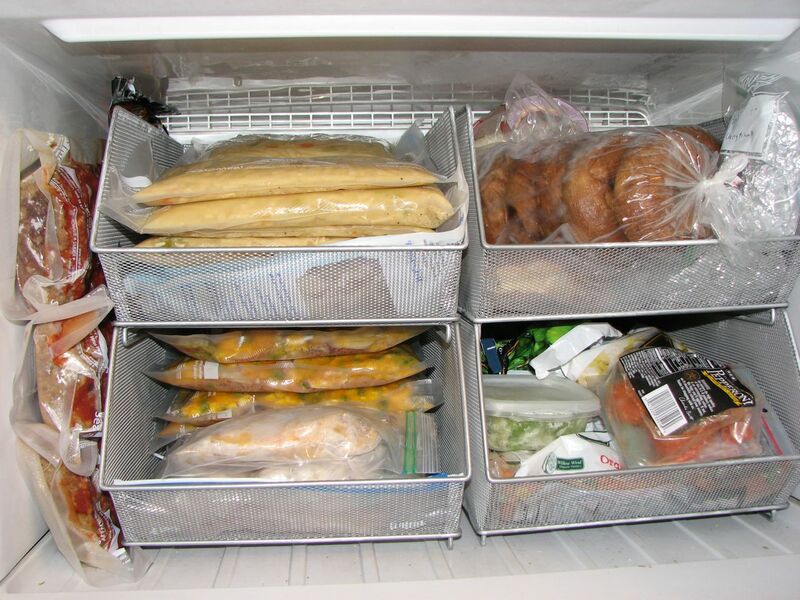 Freezing everything flat, in freezer bags, really helps to fit more things in the freezer. For those of you wondering, I found the baskets at The Container Store. They weren’t in the kitchen section of the store, but I’ve found them to be very helpful in keeping my freezer organized. The hamburger casserole I baked was from The Best Casserole Cookbook Ever. Officially, the recipe is called the Meal-In-One-Dish-Hamburger Casserole. It’s super yummy. 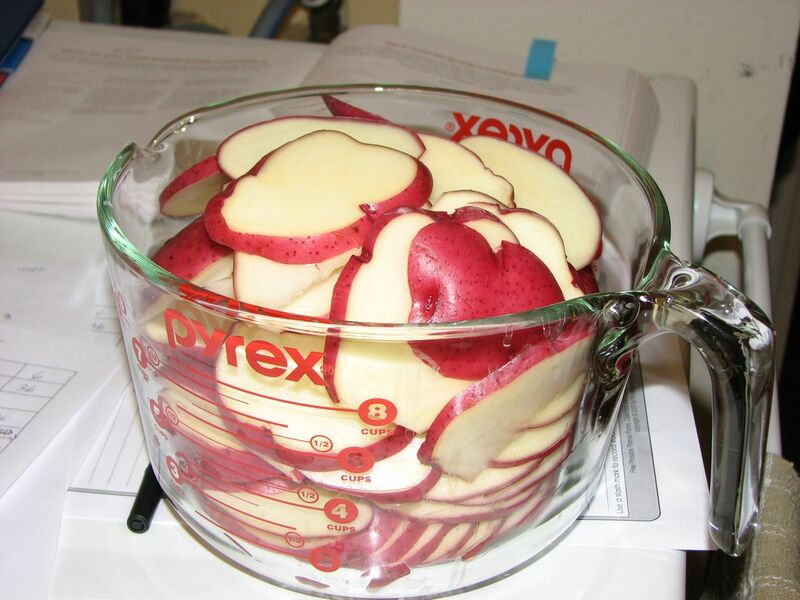 Besides chopping onions for this dish, I had to slice several potatoes. 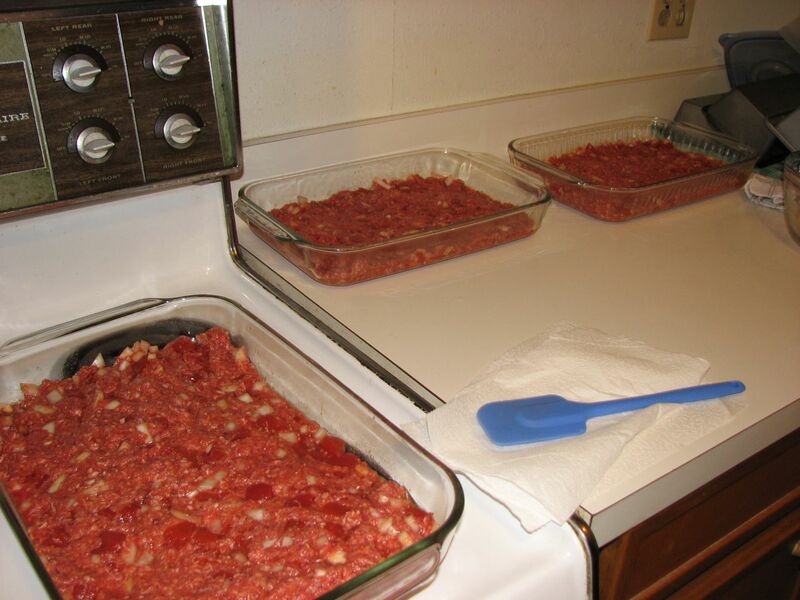 To begin, you mix lean ground beef, onions, spices, and diced tomatoes. 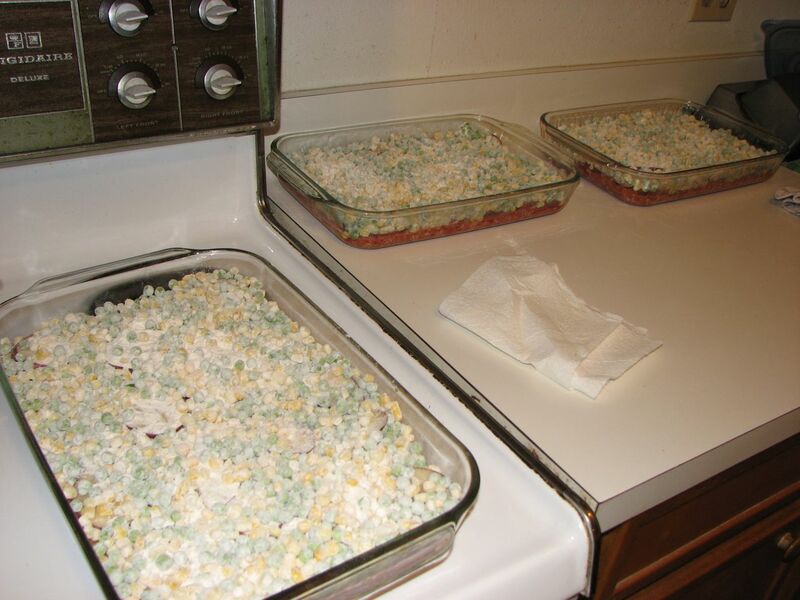 After mixing, you spread the mixture in casserole dishes. As you can see, I made 3 casseroles. The casserole dish on the stove is slightly larger than the 9 x 13 ones on the right. 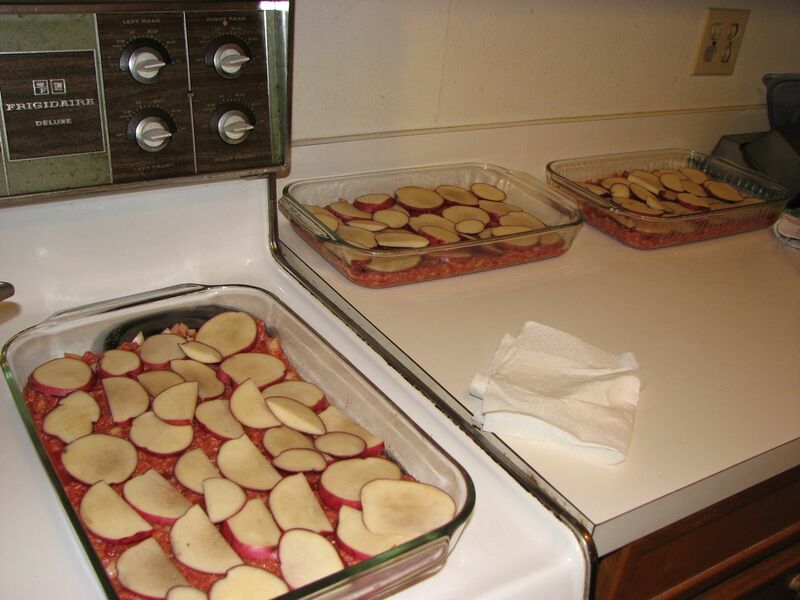 After you have put the beef mixture in the dishes, you put a layer of sliced potatoes on top. Next, you mix peas and corn with flour. The recipe also calls for bell peppers, but due to taste preferences in the family, I left them out. 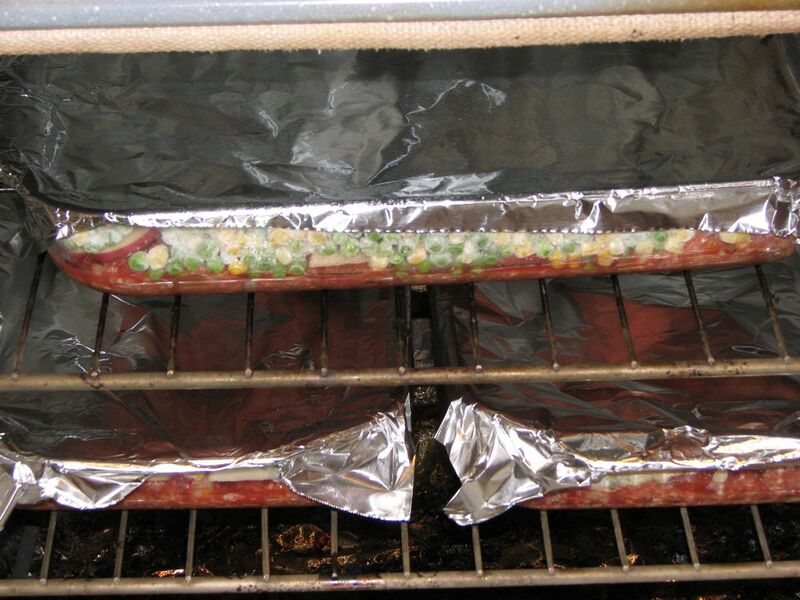 You cover and bake the casseroles for 45 minutes. As you can see, these 3 dishes completely fill my oven. 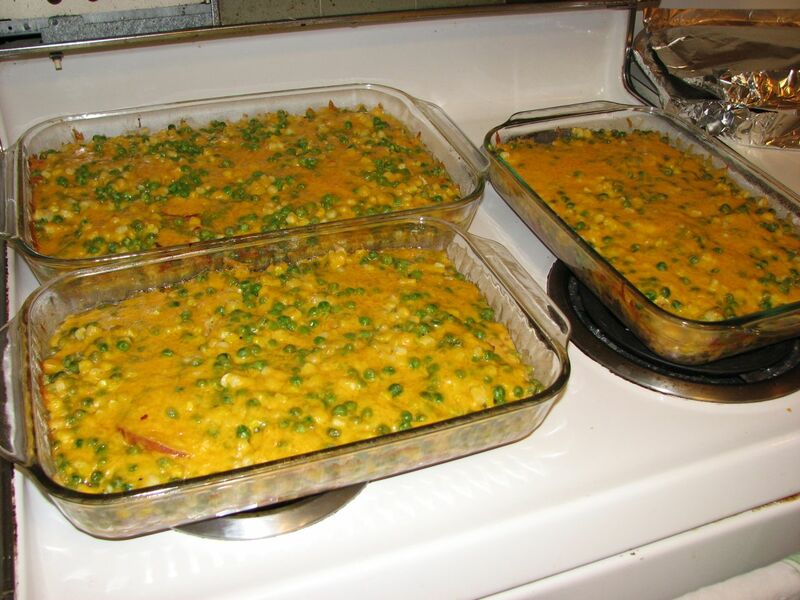 After the 45 minutes, you uncover the casseroles, spread shredded cheddar on top, and them bake them 10 minutes longer, or until the potatoes are tender and the cheese is melted. Make sure that the potatoes are tender! Otherwise, you’ll be sticking the casserole back in the oven to finish cooking after you take it out of the freezer the day you plan to eat it. I cut the large casserole in half and froze both halves. For the two smaller casseroles, I split them into thirds. I froze 2/ 3 of each casserole per bag, for 2 bags, and left the other 2/3 portion in the fridge for the following evening’s dinner. Thus, I froze 4 bags and had another portion in the fridge. 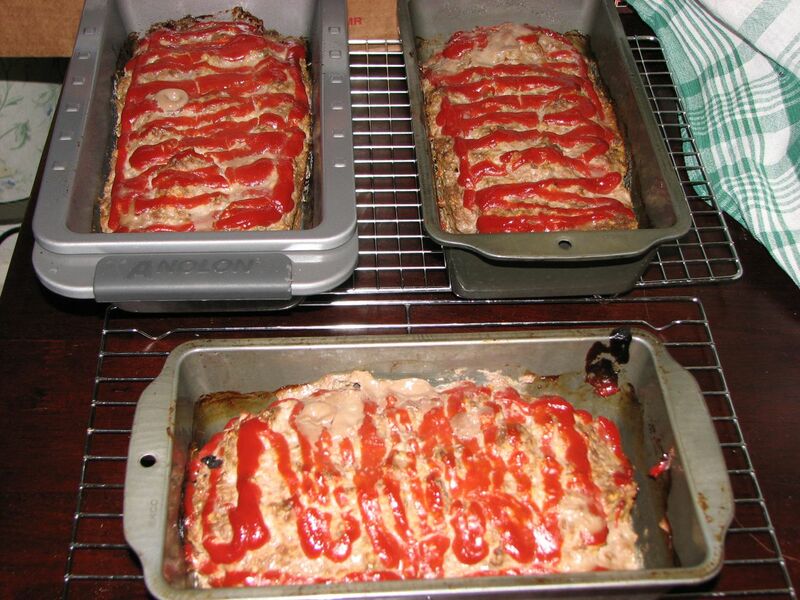 I cooked three meatloaves. I would have made more, but I only had 3 loaf pans available at the time. 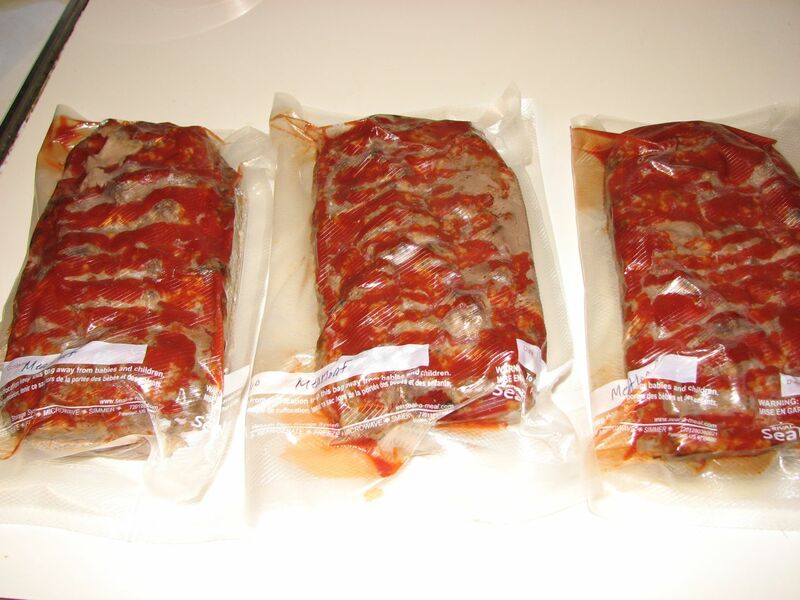 I froze each meatloaf in a vacuum-sealed bag. They look a bit Halloweenish with the ketchup! 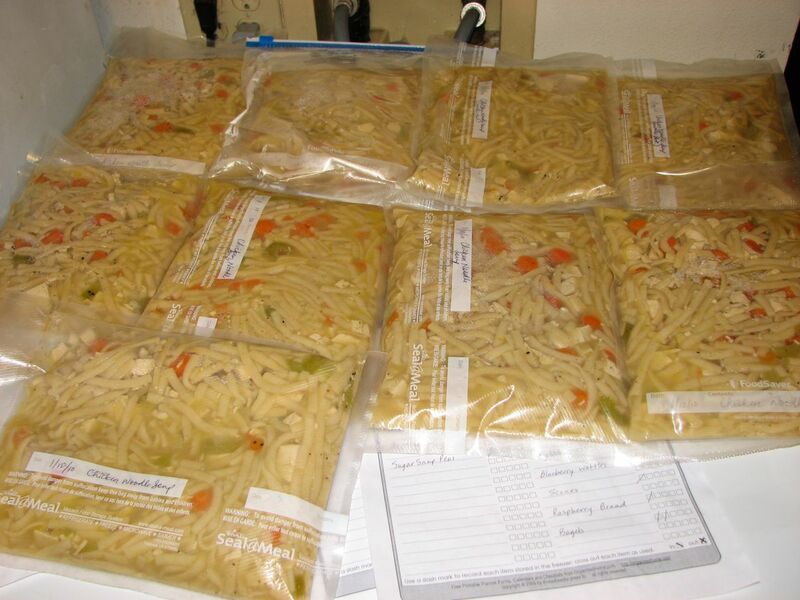 I set out to make chicken noodle soup x 6. 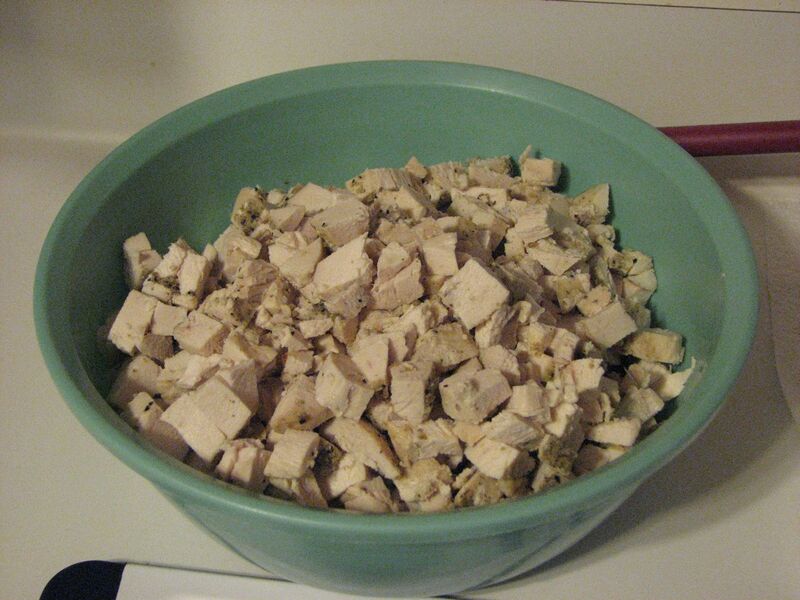 First, I had to cook the chicken, then cut it in cubes. I thought I would never get to cup number 12 of chicken! 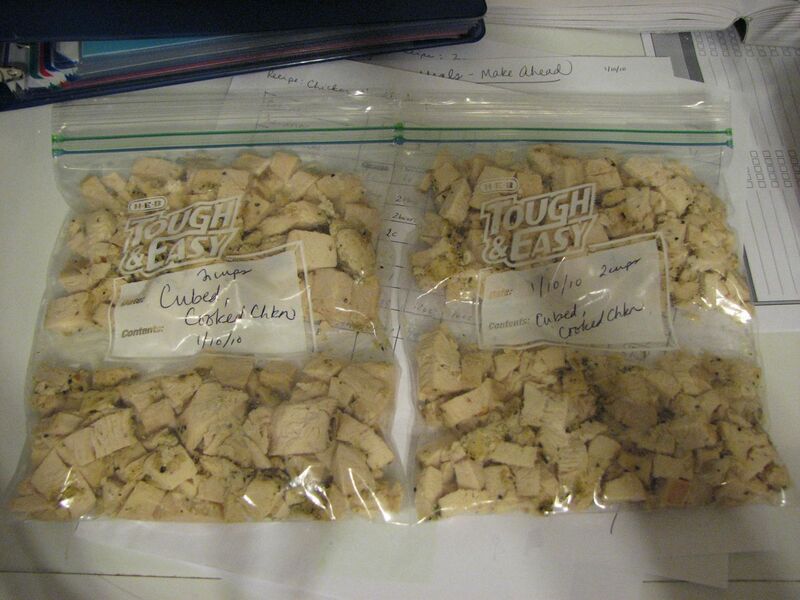 I found that one cooked chicken breast half produced about 1 cup of cubed chicken. Onion chopping was involved as well. I chopped onions for the soup and the hamburger casserole at the same time. 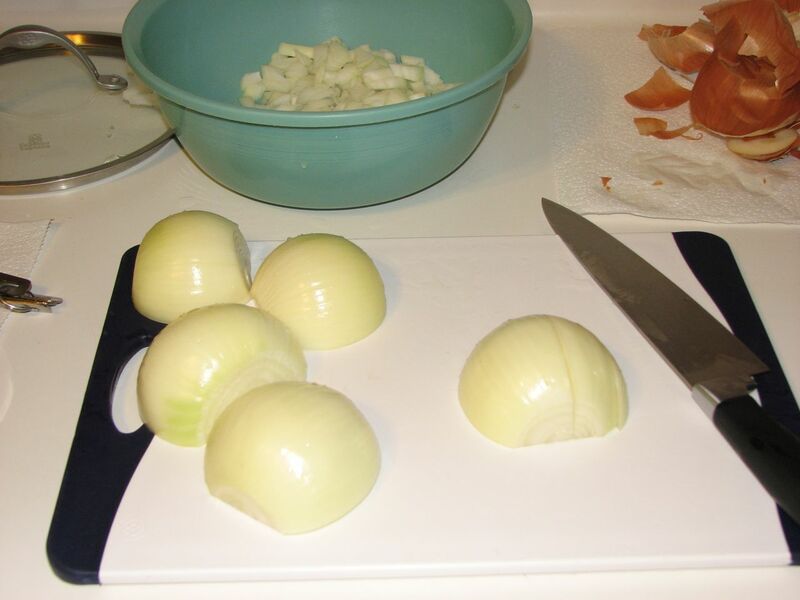 I learned that half of a medium onion will produce 1 cup of chopped onion. I had to leave the room a few times, because my eyes kept tearing up. Unfortunately, I wasn’t able to find my swimming goggles. 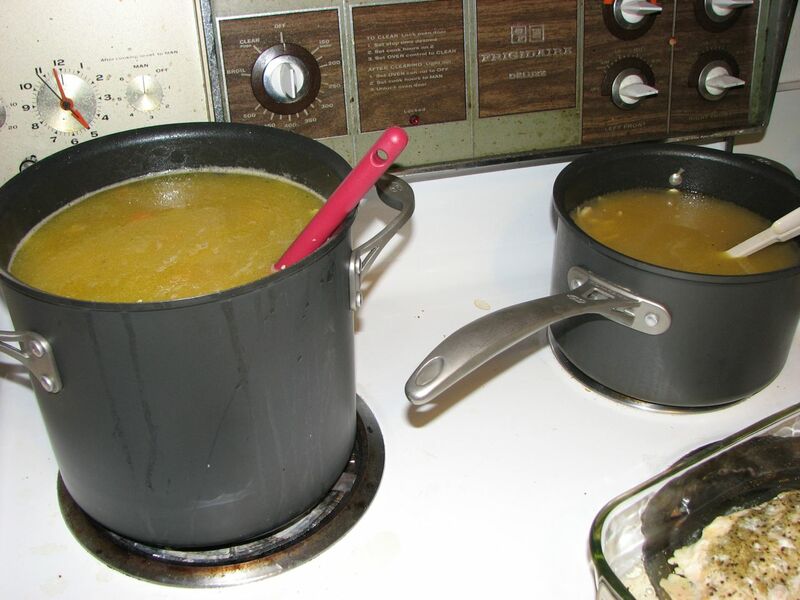 Below is a picture of the soup in progress. I still hadn’t added all of the chicken broth and space was running out. 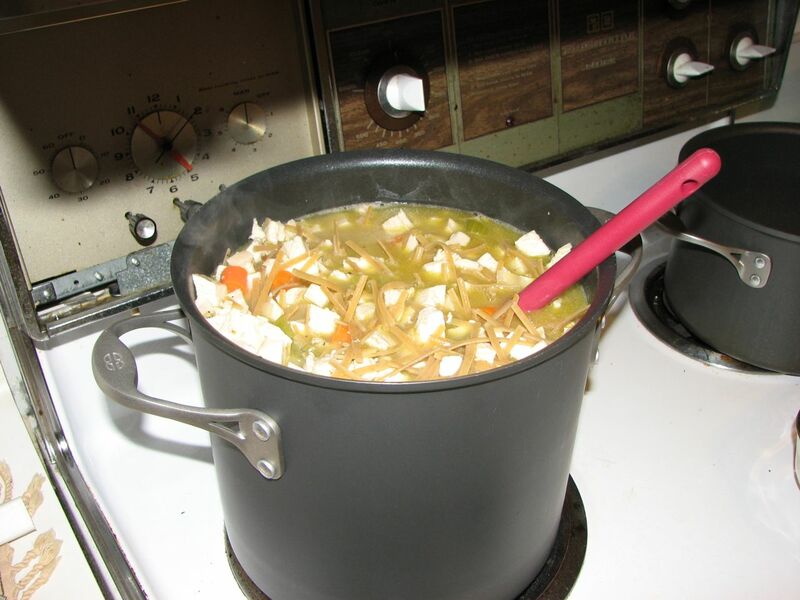 The ingredients include cooked chicken, onion cooked in butter, celery, carrots, linguine, chicken broth, and pepper. I ended up moving some of the soup into a second pot. These are the two largest cooking pots that I have. Together, they were barely large enough to hold all of the soup. 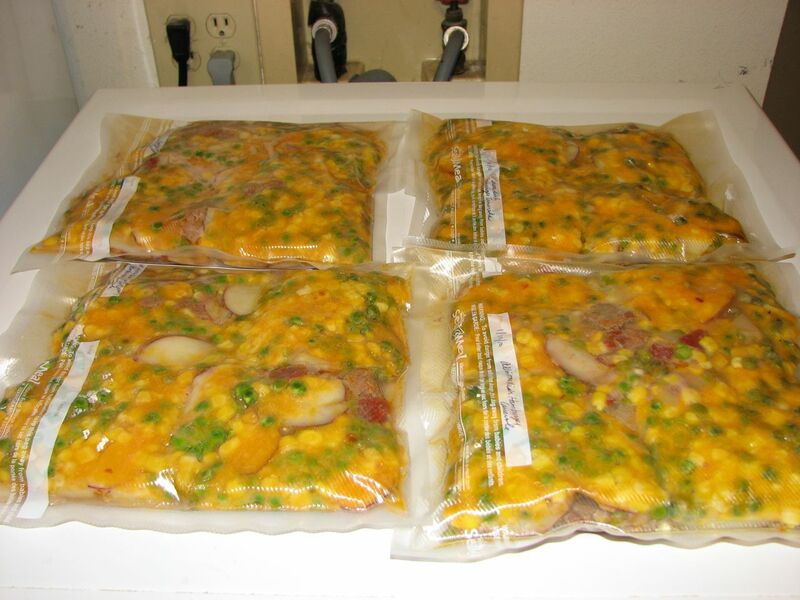 I froze the soup in 9 freezer bags. I also kept soup in the fridge for two days of lunches. I used my vacuum sealer, because I was concerned that zip bags might leak. I didn’t have room in my freezer to use plastic containers. I have square foot gardens. One is 4 ft x 4 ft. The other is 2.5 ft x 3 ft. Both have wire cages that keep critters out. This spring, I hope to build at least one more 4 x 4 box, without a cage. I will use my current 4 x 4 cage whenever I start seeds and don’t want critters digging, as well as when I am close to harvest and don’t want critters getting at my veggies. In the 4 x 4 box above, I transplanted some romaine lettuce that has finally started acting a little livelier. 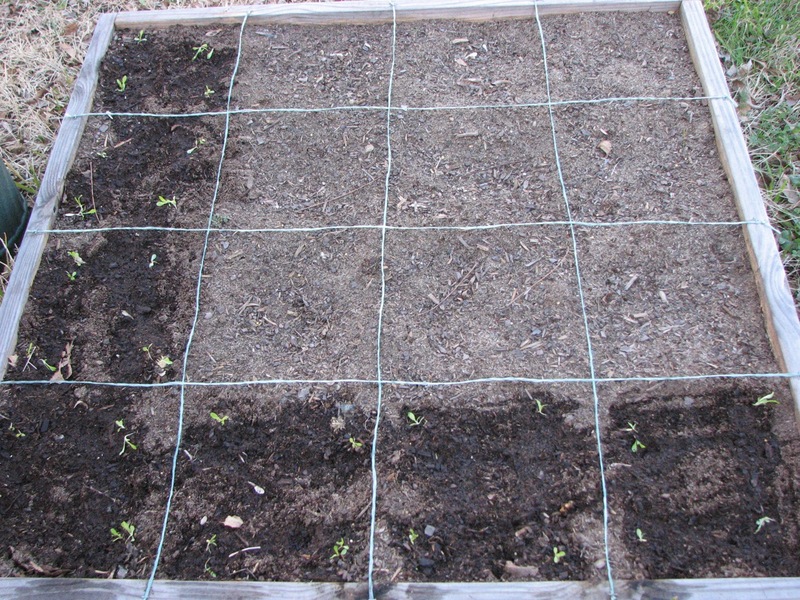 I had a few squares with lettuce scattered about in them, because I had planted the seeds around potato plants, so I moved the seedlings to four corners of seven squares. Some corners have 2 seedlings, but I can always move them when they get a bit heartier. 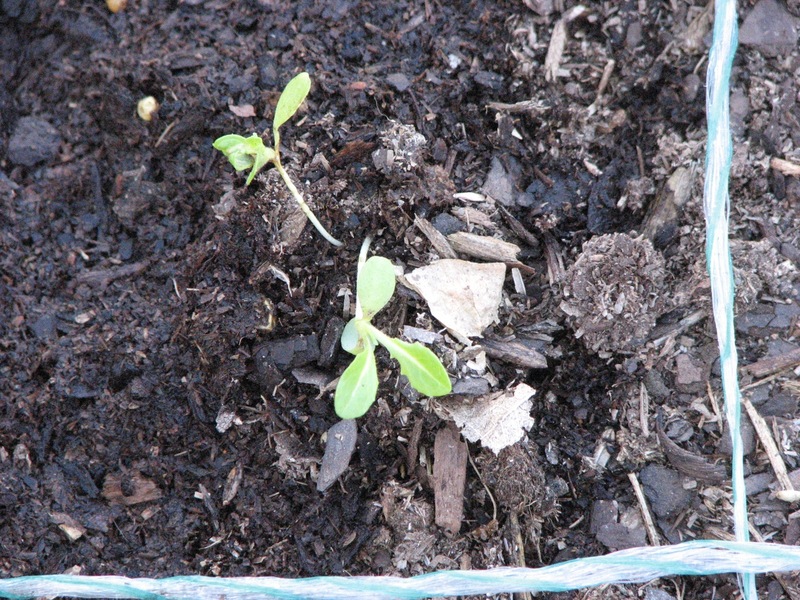 Here is a close-up of 2 seedlings in the same corner. You can see how delicate they look. I wonder how they survive being blasted about by cold front winds. This is my 2 x 3 box. The bottom square has strawberries. I now have my oregano and rosemary in the same square. The oregano is planted in a pot. I transplanted the rosemary from a different square this morning. These two herbs are the only ones that have survived our winter. 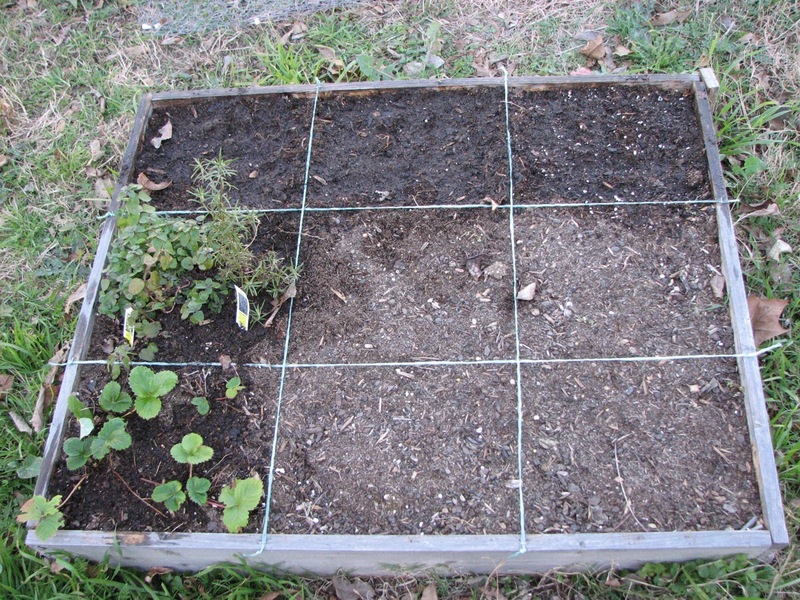 In the upper 3 squares, I have planted carrot seeds. I have not had success with carrots in these boxes before, but I am optimistic that this will be a good gardening year. Over the next several weeks, I hope to plant potatoes, onions, and other veggies. I have a few potatoes with sprouts, so I hope to plant an entire 4 x 4 box (16 squares) with them. 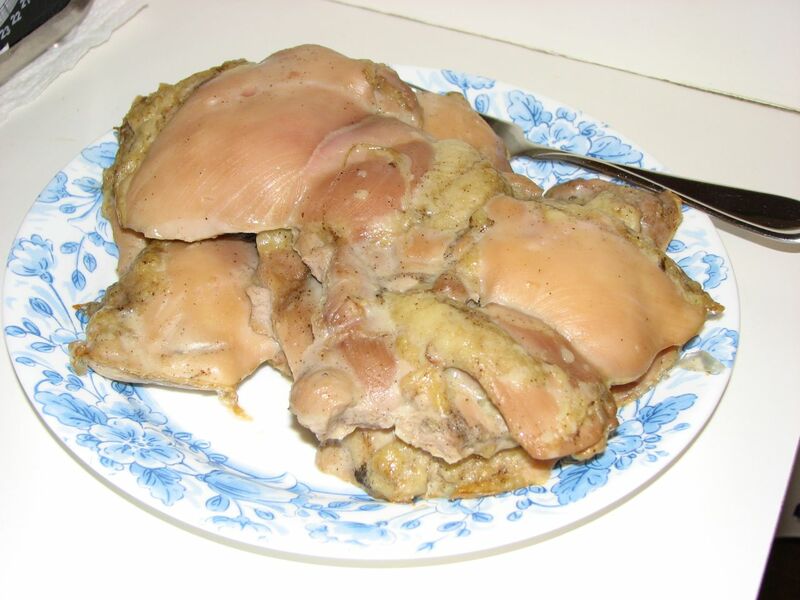 When I compared grocery prices on boneless, skinless, chicken breasts, I found that there was a better deal on frozen chicken than raw chicken. 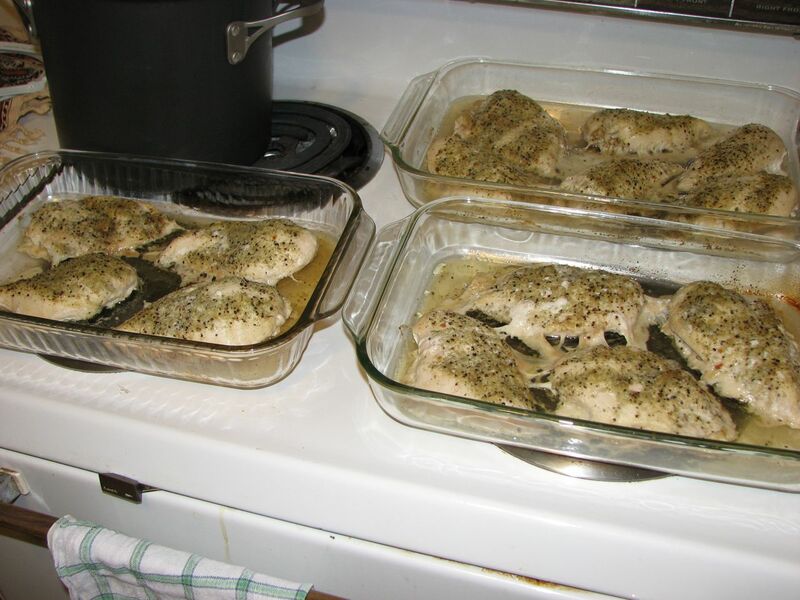 I purchased a few bags of frozen chicken and cooked it in 3 casserole dishes. 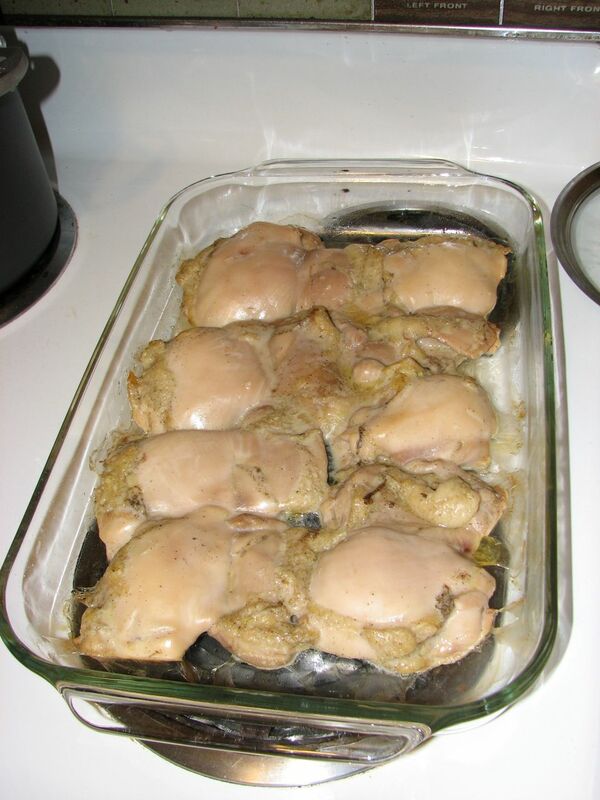 I sprayed each piece of chicken with cooking spray and sprinkled each one with Mrs. Dash Garlic and Herb Seasoning. I cooked the chicken until my meat thermometer read 165ºF. After the chicken cooled, I chopped it into cubes. 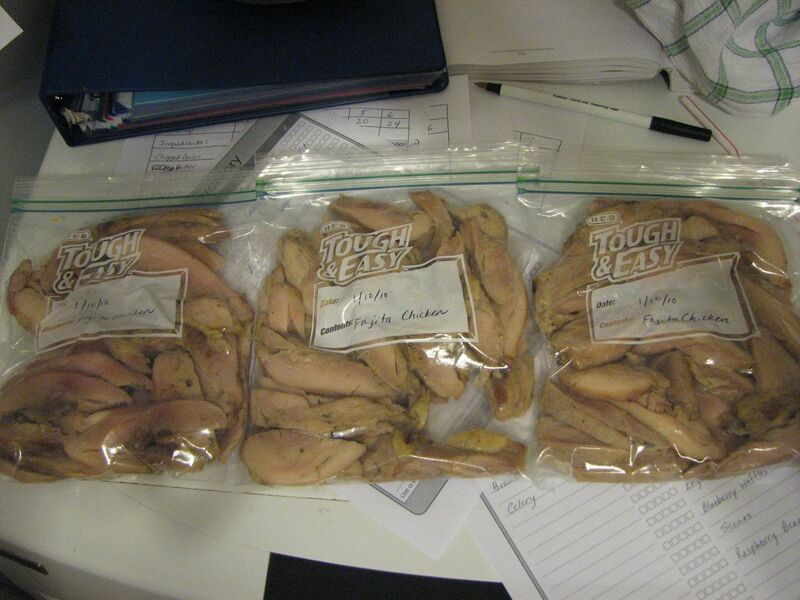 I needed 12 cups of chicken for the soup I was also making that day, but I froze the rest in freezer bags in 2 cup portions. Within each bag, I separated the chicken into two parts of the bag, so that after the chicken froze, I could remove one cup of chicken if I wanted to do so. To prepare a large amount of chicken fajitas for the freezer, I took the easy way out. I purchased pre-marinated chicken from my local grocery store. I came home, put it in a casserole dish, and baked it until my meat thermometer read 165ºF. I needed to use the casserole dish for another meal, so I moved the fajita meat to a plate until it cooled. 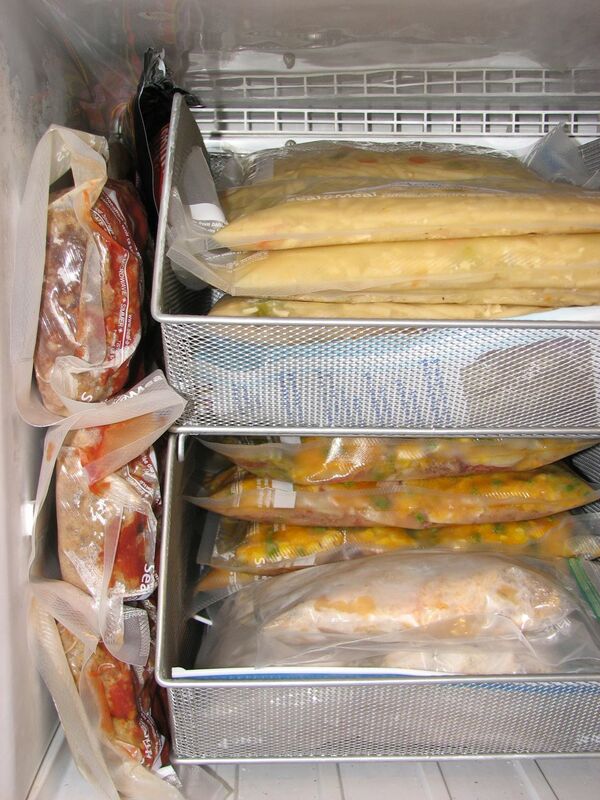 After the meat cooled, I sliced it and put the chicken in freezer bags, squeezing out as much air as possible. One batch of cooking chicken fajita meat provided 3 meals in the freezer. To serve, I just put the meat in the microwave, or allow to thaw in the fridge overnight beforehand.